Meet Laura Jean: photographer, writer, podcaster, entrepreneur, and editor extraordinaire behind Roam and Golightly (that’s @roamandgolightly on Instagram and roamandgolightly.com on the web). When I first stumbled upon Laura’s account, I was struck by the unique way in which her passion for travel complements a very obvious and heartfelt love for her homebase of Lancaster. Laura treats the streets of her own city with just as much reverence and wonder as she does those far off places. She truly is a renaissance woman: her fun blog shares the adventures of the everyday, featuring posts like “Hygge, Pennsylvania: 7 Of My Go-To Cozy Tips And Tricks” and “2018 Is The Year Of Women & Wanderlust.” She also runs a podcast and created the repeatedly sold-out Lancaster City Guide, an adorable print guide to the many interesting spots here in the Red Rose City. 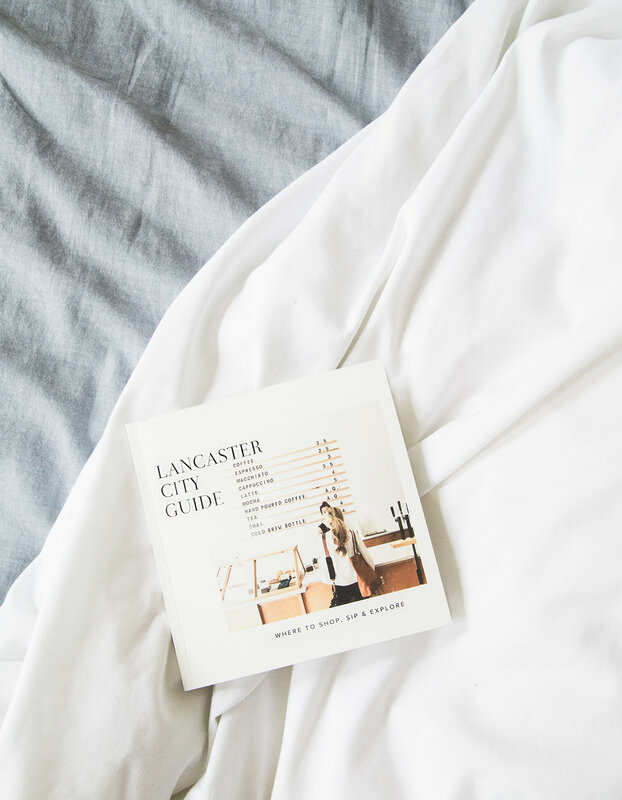 We think it’s the perfect keepsake for any lover of Lancaster, or would make an amazing present for an out of town friend, Airbnb guest, or members of a visiting wedding party—seriously, the options are endless for this cute guide celebrating of our cool town. We caught up with Laura to learn about some of her favorite Lancaster finds. Fine Living Lancaster: Are you from Lancaster originally? Laura Jean: I’m actually from the Harrisburg area! FLL: So what has your journey to Lancaster and settling here been like? LJ: I’ve always loved taking day trips to Lancaster to visit friends who are from the area, so when a career opportunity allowed me to make roots in the Red Rose City, I was absolutely thrilled. FLL: Now time for some rapid-fire favorites, for a little taste of what readers can find in your Lancaster City Guide. What’s your favorite restaurant in downtown Lancaster? LJ: Wow! There are so many to choose from. For me, it’s a toss up between Himalayan Curry & Grill and Luca. FLL: Your favorite place to get a coffee? LJ: Passenger Coffee has my heart. FLL: Best place (or two) to snap an Instagram-worthy photo? LJ: I love strolling around the Chestnut Hill area. The historic homes are gorgeous and there are lots of little, quaint details to snap. Other favorites are Passenger Coffee and the Musser Hill area. Lancaster is a minefield of gorgeous locations! FLL: Favorite place to take someone visiting from out of town? LJ: The shops on the 300 Block of North Queen are a classic! FLL: Describe your ideal day in Lancaster. LJ: I love waking up and going to the Central Market for a chocolate croissant, fresh flowers, and a coffee at Passenger or Mean Cup, shopping at Foxduck, and then a slow walk home to the Chestnut Hill area. I’m also a huge fan of seeing all the adorable dogs at Buchanan Park (I’m that girl!) and walking around the F&M campus on a beautiful day or going to Zoetropolis for an independent film. FLL:You write a lot about travel! What other city in the world reminds you most of ours? LJ: There are so many wonderful tastes of the wide world here in Lancaster! Some of the architecture downtown feels very French, the support of small, creative businesses and artists feels very European, and the amazing multicultural food culture is very unique. FLL: Finally, outside of Lancaster, what’s your favorite place in the world to travel to? LJ: Such a hard question! I fall in love with places so quickly and I could honestly see myself returning to every country I’ve had the honor of visiting. If I had to choose, it’s Rome. Always. May 16 Food Fight 2018: Woodford Reserve!